Western Washington’s persistently gray skies are like winter’s security blanket — reminding us that, around here, it’s totally OK to hibernate indoors for at least four months out of the year. Toward the end of the season, however, that blanket can start to feel like less of a comfort and more of a burden. The quickest and easiest way to shake it off? Hop in the car and head for the wide-open, typically sunny skies east of the Cascades. Wenatchee Crest trail is located at Blewett Pass, about two hours from Seattle via Interstate 90. The trail begins at the North Blewett Pass Sno-Park, located on the north side of Highway 97. A Sno-Park permit ($20 for the day or $40 for the season) is required to park; visit parks.state.wa.us to purchase. The hike is 6 miles round trip and has 400 feet of elevation gain. Hikers will reach a junction in about one-third of a mile; stay left to continue following Forest Road 800 along the ridge. 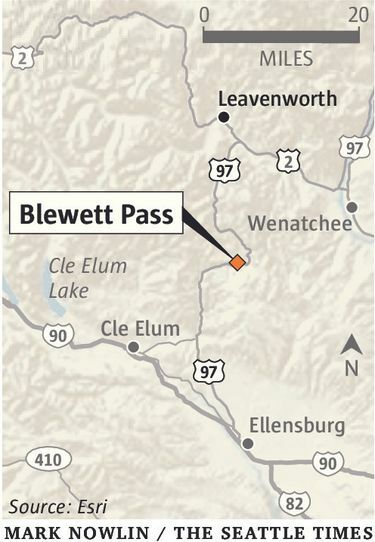 Head home via Stevens Pass and Highway 2 for a stop at Blewett Brewing, 911 Commercial St., in Leavenworth. Hours are 4 to 9 p.m. weekdays and noon to 9 p.m. weekends. Minors are currently not allowed, but that’s changing soon. See blewettbrew.com for updated information about the brewery’s merger with Idlewild Pizza. 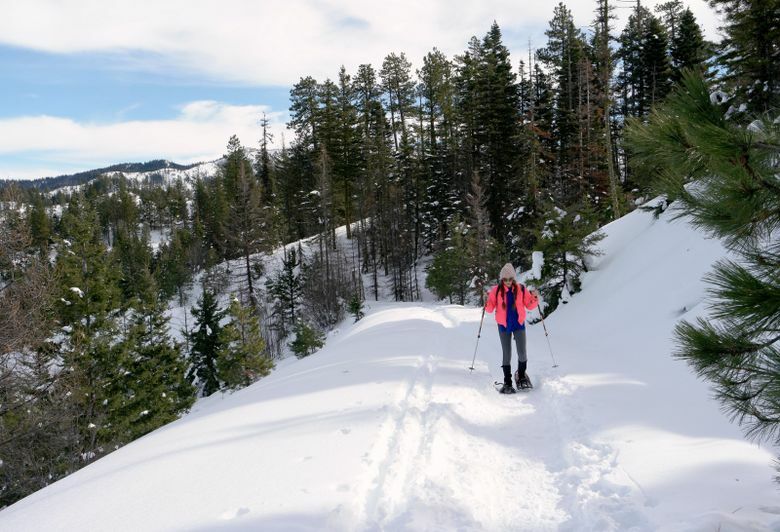 The Sno-Parks and trails around Blewett Pass offer numerous places to stretch your legs and breathe in the crisp mountain air. The pass, located on Highway 97 just east of the Cascade crest about halfway between Interstate 90 and Highway 2, stands at 4,102 feet in elevation, meaning most of the trails in the area start high and stay high. On a recent Tuesday, my sister and I arrived to find the parking area empty at the North Blewett Pass Sno-Park. It was her first time snowshoeing, so we selected Wenatchee Crest, a gentle trek that follows an old dirt road, as our destination for the day. The trail was even easier to follow than I expected. Marked on area maps as “XC 800,” our path was a signed cross-country ski route that receives occasional grooming and is popular with both skiers and snowshoers on weekends. But on this day, we didn’t see another person until the last 10 minutes of the hike. Wenatchee Ridge is designated as a “voluntary nonmotorized area,” and all was quiet once we got above the highway. The views started less than a mile into our hike. Sunlight peeked through Ponderosa pines as we followed the path up and around the ridgeline. We took several breaks to admire the snowy Stuart Range, which dominated the view to the north, and the more-distant volcanoes visible on the southern horizon. Our turnaround point was a clearing near the end of the road, about 3 miles from our car, but a shorter trek would be just as rewarding. 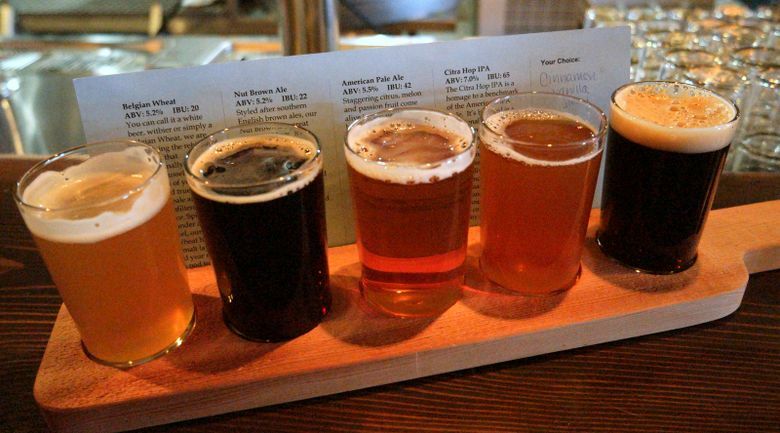 The fastest route to Blewett Pass from Seattle is typically via Interstate 90, but on this day we took the more scenic Highway 2 route in order to check out the latest addition to Leavenworth’s growing brewery scene. The Bavarian-themed tourist town, about a 20-minute drive north of Blewett Pass, still has its fair share of overpriced schnitzel and kitschy beer halls, but recent openings have given outdoor enthusiasts a welcome reprieve from the post-hike bratwurst and liter of German lager. Blewett Brewing opened last September next door to Idlewild Pizza, a 3-year-old shop that serves delicious wood-fired pies. Sometime in the next few weeks, the two businesses plan to remove the wall that separates their establishments and combine into one all-ages brew pub. For now, the brewery includes a handful of tall tables and an L-shaped bar that looks onto the 3½-barrel brewing system. The taps feature four house beers, including a tangy Citra Hop IPA, plus three seasonal brews (such as Cinnamon Vanilla Bean Imperial Stout) and a guest cider. Brewery patrons can swing by the pizza shop first and order a pie for delivery to the brewery. Head brewer and co-owner Grant Stoebner points to Doghaus Brewing, a nano brewery that opened in 2015, and a forthcoming 40-tap beer bar as evidence that Leavenworth’s beer scene is taking off. The two new breweries join Icicle Brewing, the only craft-beer game in town for several years. Together, they appear to be meeting a demand for folks who are more likely to walk in wearing a puffy jacket than lederhosen. Caitlin Moran: 206-464-3226 or cmoran@seattletimes.com. On Twitter: @CaitlinJMoran.